Hamilton County is a county located in the U.S. state of New York. It is named after Alexander Hamilton, the only member of the New York State delegation who signed the United States Constitution in 1787 and later the first United States Secretary of the Treasury. Its county seat is Lake Pleasant. It is one of only two counties that lie entirely within the Adirondack Park (Essex is the other), it is one of the most sparsely populated counties in the entire eastern United States, with just over 5,000 residents. 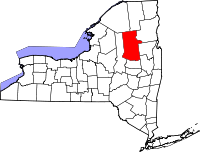 When counties were established in New York State in 1683, the present Hamilton County was part of Albany County. This was an enormous county, including the northern part of New York State as well as all of the present State of Vermont and, in theory, extending westward to the Pacific Ocean. This county was reduced in size on July 3, 1766 by the creation of Cumberland County and further on March 16, 1770 by the creation of Gloucester County both containing territory now in Vermont. On March 12, 1772, what was left of Albany County was split into three parts, one remaining under the name Albany County. One of the other pieces, Tryon County contained the western portion (and thus, since no western boundary was specified, theoretically still extended west to the Pacific). The eastern boundary of Tryon County was approximately five miles west of the present city of Schenectady, and the county included the western part of the Adirondack Mountains and the area west of the West Branch of the Delaware River. The area then designated as Tryon County now includes 37 counties of New York State. The county was named for William Tryon, colonial governor of New York. In 1789, Montgomery County was reduced in size by splitting off Ontario County. The actual area split off from Montgomery County was much larger than the present county, also including the present Allegany, Cattaraugus, Chautauqua, Erie, Genesee, Livingston, Monroe, Niagara, Orleans, Steuben, Wyoming, Yates, and part of Schuyler and Wayne Counties. In 1791, Montgomery County was reduced further in size by splitting off Herkimer, Otsego, and Tioga Counties. In 1802, Montgomery County was reduced further in size by splitting off a part which was combined with portions of Clinton and Herkimer Counties to form St. Lawrence County. In 1816, Hamilton County was created by splitting it off from Montgomery, but was not completely organized as a county until 1847 due to low population. The former Town of Gilman was dissolved in 1860. The original county seat was Sageville, now part of Lake Pleasant. Hamilton County is in the central part of the state, northwest of Albany. It lies enirely within the Adirondack Park and consists mostly of publicly owned parkland. According to the U.S. Census Bureau, the county has a total area of 4,682 km² (1,808 sq mi). 4,456 km² (1,720 sq mi) of it is land and 226 km² (87 sq mi) of it (4.84%) is water. Snowfall averages 100 inches per year. As of the census2 of 2000, there were 5,379 people, 2,362 households, and 1,558 families residing in the county. This makes it the least populous county in New York state. The population density was 1/km² (3/sq mi), again the lowest in the state. There were 7,965 housing units at an average density of 2/km² (5/sq mi). The racial makeup of the county was 97.73% White, 0.45% Black or African American, 0.26% Native American, 0.15% Asian, 0.06% Pacific Islander, 0.67% from other races, and 0.69% from two or more races. 1.06% of the population were Hispanic or Latino of any race. There were 2,362 households out of which 23.60% had children under the age of 18 living with them, 55.70% were married couples living together, 6.70% had a female householder with no husband present, and 34.00% were non-families. 29.60% of all households were made up of individuals and 13.70% had someone living alone who was 65 years of age or older. The average household size was 2.24 and the average family size was 2.74. In the county the population was spread out with 19.70% under the age of 18, 5.20% from 18 to 24, 24.20% from 25 to 44, 30.90% from 45 to 64, and 20.00% who were 65 years of age or older. The median age was 45 years. For every 100 females there were 100.00 males. For every 100 females age 18 and over, there were 99.40 males. The median income for a household in the county was $32,287, and the median income for a family was $39,676. Males had a median income of $29,177 versus $21,849 for females. The per capita income for the county was $18,643. About 6.00% of families and 10.40% of the population were below the poverty line, including 10.50% of those under age 18 and 8.70% of those age 65 or over. => Label in parentheses indicates official political designation. Because Hamilton County is entirely within the Adirondack Park, it has a low population of year-round residents, but this population increases at least fivefold during summer months. Hamilton County is the smallest in the state based on its population (Kings County is the largest). Almost one-quarter of the county population is aged 65 or greater. Tourism is almost the sole industry of the county. Another large sector is employment by government agencies, including the school districts. There is no agriculture due to the short growing season and the potential for frost during every month. Logging, retail sales, and a few small industries contribute to the economy. The county is perennially the most Republican of New York state, being the only one to be won by Howard Mills during the 2004 Senate election. It also voted for John Faso for Governor, and for John Spencer for the Senate in 2006. Hamilton County is bordered on the west by Herkimer County. Fulton County forms the southern boundary. Essex, Warren, and Saratoga Counties make the eastern boundary. The northern boundary of Hamilton County is formed with St. Lawrence and Franklin Counties. This page uses content from the English language Wikipedia. The original content was at Hamilton County, New York. The list of authors can be seen in the page history. As with this Familypedia wiki, the content of Wikipedia is available under the Creative Commons License.